Bahula Chaturthi or Bol Choth is regarded as one of the cultural festivals of India where the farming community, particularly women worship the cattle. Bahula Chaturthi festival is celebrated in almost all the regions of India during the month of Shravana. This holy festival is majorly observed in Gujarat. 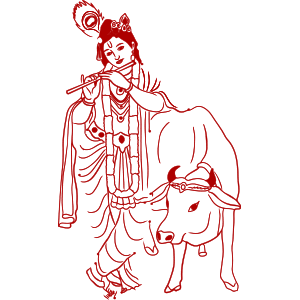 Both the calves and the cows are worshipped in Hindu religion. The worshipping of cows on the day of Bahula Chaturthi bestows the observers with good fortune. All the devotees abstain themselves from consuming any kind of milk or milk product considering that only calves possess the right to have cow milk. The devotees worship the idols or picture of Lord Krishna signifying his association with cows which are known as Suabhis. All the devotees of the farming community wake up early morning, wash the sheds and give a bath to the cattles on this occasion. A variety of dishes are also prepared which are made from rice to offer the same to cattles. As per Hindu Calendar, Bahula Chaturthi performed on Shravana Krishna Chaturthi. What Is The Story Behind Bahula Chaturthi? There is a specific story behind the celebration of Bahula Chaturthi and keeping a Bahula Chaturthi Vrat. Bahula Chaturthi Vrat Katha holds much significance in the state of Gujarat. There was a cow named Bahula which was coming back home in order to feed her calf. On her way to home, she faced a lion. Bahula got scared to death but with enough courage she said to the lion that she needs to feed her calf. Bahula asked the lion to let her go, once she will feed the calf, she will return and then he can have her. The lion set her free and waited for her to come back. Also See: When is Ganesh Chaturthi celebrated? Bahula did return after feeding her calf which surprised the Lion. He was quite shocked and impressed with the cow’s commitment towards her child, so he freed her and let her go back. This depicts that even physical strength, anger and passion of the lion had to stoop in front of the care and love of the cow for her calf. From that particular day, the devotees celebrate Bahula Chaturthi by sacrificing cow’s milk and save it for the calves only. It is a token of worship which they perform for seeking the blessings of the deity. Read most accurate horoscope predictions free here!